About 100 species, in Europe, Asia and North Africa. There are 80 species in the FSU. Most are distributed in Central Asia. Only a few occur in the Caucasus. Among them are: T. biebersteniana Schult. et Schult. fil., T. biflora Pall. (=T. polychroma Stapf), T. eichleri Regel, T. florenskyi Woronow, T. gesneriana L. (T. schrenki Regel), T. humilis Herb., T. confusa Gabrielian, T. julia C. Koch (=T. montana auct. ), T. lipskyi Grossh., T. schmidtii Fomin and newly recorded T. kaghyzmanica Fomin. All species are ornamental and some of them deserve special attention. For example, T. confusa has aromatic flowers more than 6 cm long; also lilac pink flowers of T. lipskyi are of an unusual color; T. eichleri has large red flowers, and the species is resistant to virus diseases. These plant species can be used in horticulture, in private gardening and they are of extremely importance for hybridization. The true Kingdom of tulips is Central Asia and Kazakhstan, where 70 species can be seen. In the wild all species are very attractive. They grow in different habitat, but avoid acid soil. 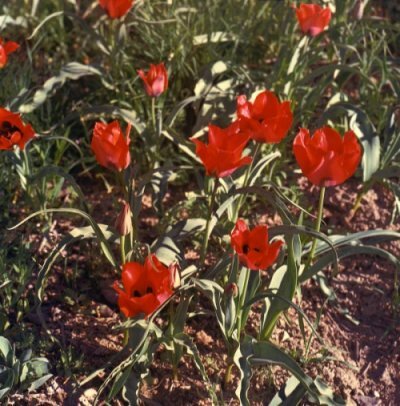 However, in cultivation many tulips require special conditions, and some of them are short-lived. The size of flowers increases under cultivation, sometimes flowers are two times or more larger. Many species have been tested in St. Petersburg, only those that are easy in cultivation are recommended below.